British Official Photograph. Approximately 20 x 15cm. Captioned to rear ' More Bombs on Berlin : Stirlings Leave For Heavy Raid 31/8/43 - RAF bombers made another heavy attack on Berlin on the night of 31/8/43, dropping a great weight of high explosive and incendiary bombs in 45 minutes. Many night fighters were up over teh traget and along the route but they failed to break up the concentrated attack and preliminary reports indicate that great damage was done. 20 big Stirlings take off in 27 minutes from an RAF bomber stationm bound for Berlin. 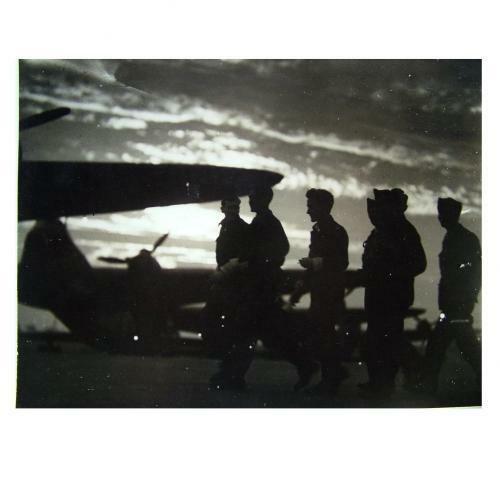 Photos shows : As the sun sets, a Stirling crew walk out to their aircraft.' Marked for immediate publication. Photo is Air Ministry crown copyright. of Planet News Ltd, London. Generally very good but is a dark image. Stock code P16185.